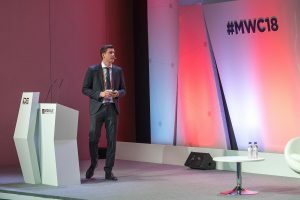 The MWC is the world’s largest exhibition for the mobile industry featuring prominent executives representing mobile operators, device manufacturers, technology providers, vendors and content owners from across the world. The IDE Summit was once again organised by E.J. Krause & Associates in collaboration with GSMA, the organiser of the MWC and located in the NEXTech Hall featuring different pavilions dedicated to specific technologies and platforms such as drone, VR/AR, robotics and artificial intelligence spaces. Mike Rosenberg, Senior VP of E.J. Krause & Associates and his team put together a programme of presentations and panel discussion which aptly combined the future developments of the world of mobile communications with hot topics of rapidly developing drone market. 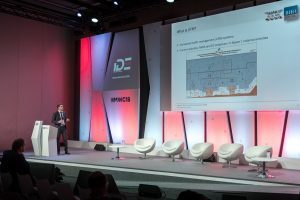 After its successful debut in Europe last year, the event attracted a crowd of over 250 interested stakeholders and drivers of the drone environment and beyond. IDE Drone Summit presented keynotes and panel discussions with influential leaders from the European Commission, mobile industry, drone manufacturers, drone users and law firms to discuss integration of mobile technologies into the drone Business. This year’s moderator Michael Wieland, Managing Director of UAV DACH and Executive of COPTERview air DATA led through the Summit. 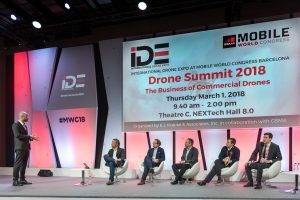 Representatives from large telecommunication companies, governmental organisations and the industry gave exciting insights on the development of the drone market and future perspectives. One of the big issues on how the drone industry can affect the mobile industry and vice versa. Massimiliano Versace of Neurala highlighted the interconnectivity of drone technology and AI, by showcasing how the technology can shape existing and create new jobs in the future in his keynote speech. The host country Spain presented its approach of integrating drone technology into its infrastructure and its current regulatory achievements to align their regulatory framework with European regulatory initiatives. Joachim Lücking of the EC presented one of those initiatives – the U-Space concept. In his presentation, he highlighted the rules and regulations needed to start U-Space. One of the main topics of the Summit was that of Unmanned Traffic Management (UTM). The presentations focused on the technology behind different UTM Systems, Security of the Technology and legal issues concerning UTM. The presentation from BHO Legal provided ideas on legal issues that need to be considered when establishing UTM Systems, while ensuring public acceptance and an effective development of UTM. With the great response of this year’s European Drone Summit it is only natural that the event will return to the MWC in 2019. Given the incredibly quick development of the market and the active regulatory activity and many pending technical, social and legal issues, it can be expected that the event will continue to grow in the future. The IDE Drone Summit Europe will definitely be worth a visit.